Recognize this SUV? - DAMN Riders - No rules, Just ride! I don't really want to sell it, but I don't need it either. It's a great vehicle for transporting the dirt bike to/from events and camping in, but I have a beater F150 I can do that in, too. 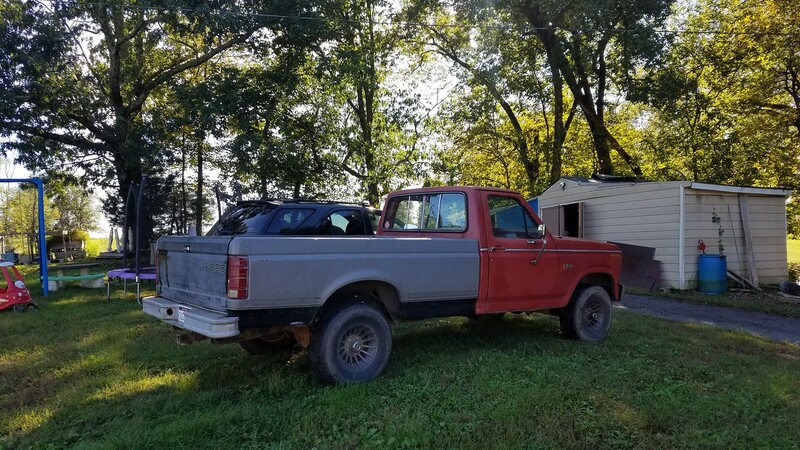 The F150 is slower, not as luxurious, has no AC, and only gets crappy fuel mileage, but for hauling scrap metal and household junk it is far more useful. I'd go down to $2000 if another DAMN rider wanted it. It has a newish starter, too. What kind of gas mileage do you get out of it? Any known mechanical issues? It gets pretty poor mileage, actually. About 16 MPG. I read up on it and it's the norm for these older Sorentos using old "truck" style orientations--low power, big displacement V6 mounted the right way with the transmission going out the back, regular Hi/Lo transfer case, real ladder style frame, etc. The only "issues" with it are that the right rear door lock actuator makes an awful noise when it's locking, but it locks and unlocks just fine and has the entire time I've had it. It has a very slight oil leak around the intake gasket, but it's not enough that I've bothered replacing it. It got a new starter and new parking brake shoes when I bought it from Kirk. Not listed in the ad, but I added a set of AirLift rear helper springs recently to it. 5-35 PSI in the air bags inside of the rear coil springs to keep the rear end from squatting when there's a bike on the hitch. I normally drive it with 10 PSI in there and bump it up to 25 PSI with a bike on the rear. Thanks for the run down Jed. I am looking for a beater to keep the new truck out of the salt this winter. I know you are a good mechanic so its attractive but I was hoping for something with better MPG. Let me noodle on it a little bit. The sorento, with those tires, is an unstoppable force in the snow (they are M+S rated). I live on a steep hill and never had any trouble getting up the hill. The mileage was always a disappointment though. I got the same mileage in the sorento as I had in the 97 suburban it replaced. Still, I have missed that little truck. The Kia sold today to a local.